The days are getting shorter, the weather is getting cooler, and before you know it, Halloween will be here. While I love Halloween just as much as the next person, it’s not hard to look around and see how scary it is for the environment. From single-use plastic candy wrappers to cheap plastic decorations, Halloween produces a lot of waste. 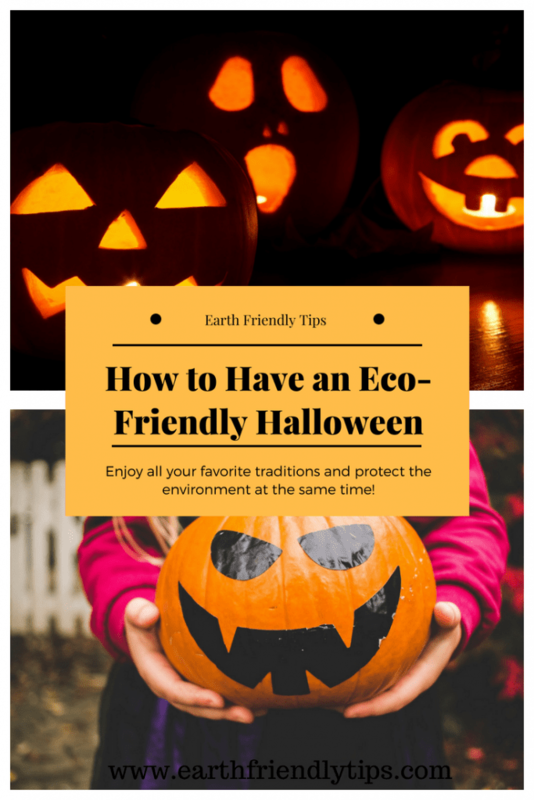 Fortunately, if you’re looking to have an eco-friendly Halloween, there are several easy steps you can take. The scariest part of Halloween might be what those store-bought costumes are made with. Many costumes are created using synthetic fibers and non-recyclable petro-chemical based plastics. Even worse, some of them can contain polyvinyl chloride (PVC). This soft plastic is a known carcinogen that releases harmful toxins when it’s made and when it breakdowns. Instead of buying a Halloween costume, consider making one from what you already have around the house. A quick search on Pinterest will show you an incredible number of ideas for making your own costume. 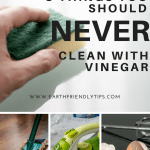 You can check out the Earth Friendly Tips Pinterest page for ideas and follow along for even more eco-friendly tips. To find items for your costume you might not have at home, browse through thrift stores. If you don’t have time to make a costume, there are also companies out there that rent costumes. Before you reach for that face paint to create a spooky ghost or frightening vampire, consider a pretty scary study done by the Campaign for Safe Cosmetics that tested 10 face paints and found lead in all of them and high levels of skin allergens like chromium, nickel, and cobalt in six of them. Rather than risk lifelong damage, you can have an eco-friendly Halloween by choosing a natural face paint instead. 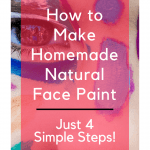 It’s very easy to make your own homemade natural face paint. However, if you’re pressed for time, you can also purchase organic and non-toxic face paint. Rather than just grabbing the first bag of candy that you see on the shelf in the grocery store that might contain dangerous chemicals or pesticides, consider an organic chocolate candy or eco-friendly candy option instead. Endangered Species Bug Bites – Chocolate squares made with ethically traded cacao. The company also donates a percentage of the profits to support conservation efforts. Unreal Candy – Made using Non-GMO Project Verified, certified gluten-free, Fair Trade certified, and responsibly sourced ingredients. Glee Gum – Made with sustainably harvested chicle instead of a synthetic mix of materials. Non-GMO Project Verified and made without artificial colors, flavors, sweeteners, or preservatives. You can also recycle the cardboard boxes. GoOrganic Fruit Chews – Gluten-free, vegan, and made using Non-GMO Project Verified, USDA Certified Organic ingredients. YumEarth Organic Lollipops – USDA Organic, gluten-free, vegan, kosher, Non-GMO Project Verified, dairy-free, and nut-free. You can also get them in bulk bags, which makes them a better economical option if you get a lot of trick-or-treaters. You can use every single part of jack-o-lantern to make sure none of it goes to waste. When you’re carving it, you can either save the pulp to make pumpkin pie, pumpkin muffins, or pumpkin bread, or you can compost it. Spread the seeds out on a baking sheet, coat them with a light oil, sprinkle salt on them, and bake them for a roasted pumpkin seed snack. When Halloween is over, toss that pumpkin in the compost pile. You just enjoyed a zero-waste jack-o-lantern! Those plastic pumpkins kids carry around to collect their candy are practically a symbol of Halloween. However, they’re cheaply made and will never breakdown in the landfill. Reusable shopping bags or canvas bags work just fine as a trick-or-treat bag. Even better, it’s something you already have in your house, so you don’t have to spend more money on a item that will only get used a few times. Rather than buy cheap, plastic Halloween decorations, look for eco-friendly options instead. You can stuff old pillowcases with leaves or newspaper to turn them into homemade ghosts. If you have black pantyhose that have a run in them, don’t throw them away. Instead, use them to make spooky spider webs. LED Halloween lights use less electricity than traditional lights, but an even better option is choosing solar Halloween lights that use zero electricity. Another option is to decorate for the fall season instead of Halloween alone. This can include using leaves to make a fall garland, sticking branches in a pot for an autumn topiary, or creating your own fall wreath using leaves, acorns, and berries. Depending on where you live, by the time trick-or-treat night rolls around, the weather could be a little chilly, and you might be tempted to load everyone in the car to go trick-or-treating. However, all that idling pumps out a ton of emissions and wastes gas. Instead, grab a few flashlights, put on some coats, and walk around the neighborhood. If you have young kids who might not be able to handle a long walk, load them up in a wagon. 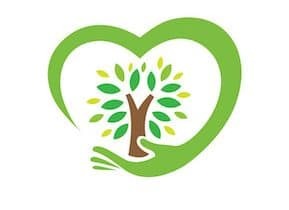 Not only is walking a more environmentally friendly option, it also gives you and your children a chance to meet other people in your neighborhood. If you need to drive to another neighborhood because the one you live in doesn’t have a trick-or-treat night, see if you can arrange a car pool with other people so you’re only taking one car instead of multiple vehicles. 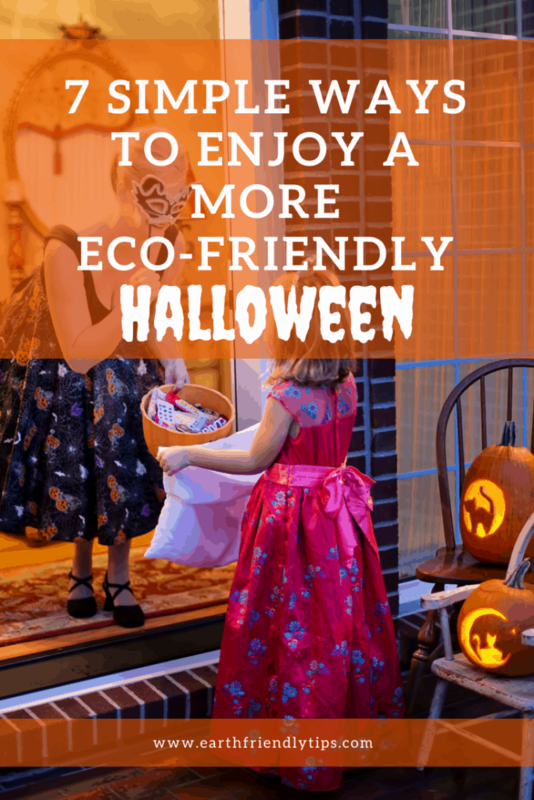 With these simple suggestions you can enjoy an eco-friendly Halloween and feel good knowing you’re not causing any frightening harm to the environment.